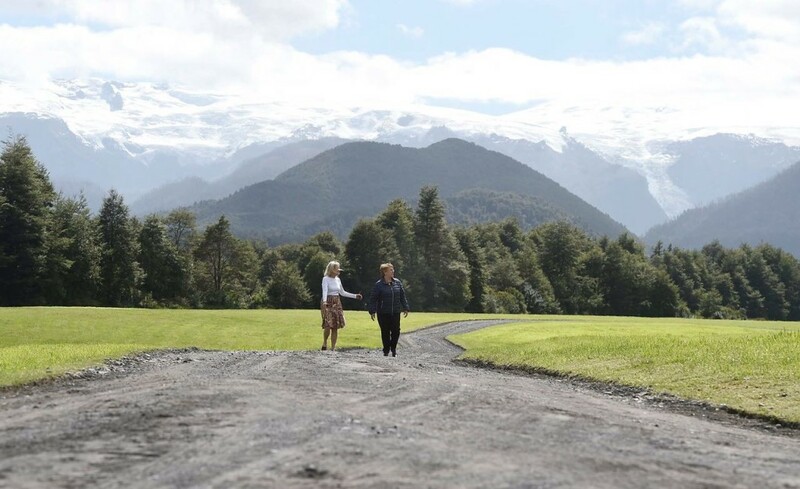 PUMALÍN PARK, CHILE (March 15, 2017) – Chilean President Michelle Bachelet and Kristine McDivitt Tompkins, leader of Tompkins Conservation, today signed a pledge to dramatically expand national parkland in Chile by approximately 10 million acres. The proposal includes the largest land donation in history from a private entity to a country; the total area to be protected, via this private land donation plus government land, is three times the size of Yosemite and Yellowstone National Parks combined. 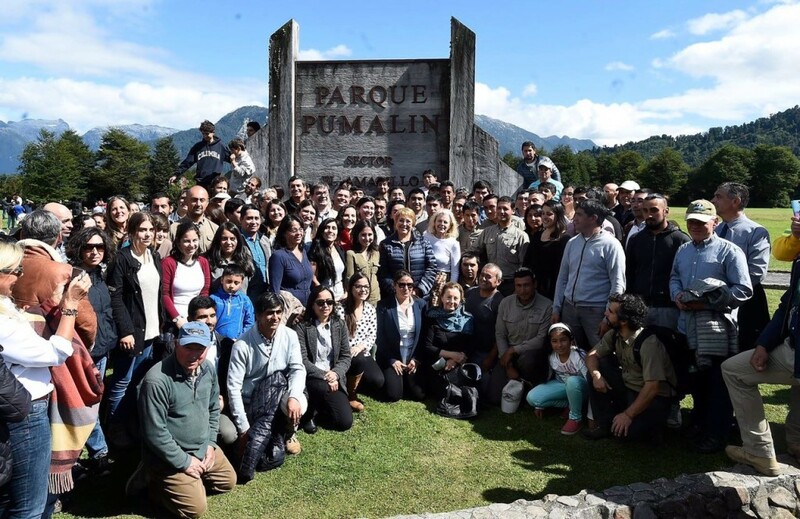 When fully executed, the agreement will create five new national parks — including two crown jewels of Tompkins Conservation’s park creation work, Pumalín Park and Patagonia Park, and the 1 million acres and world-class infrastructure they contain — and expand three others. 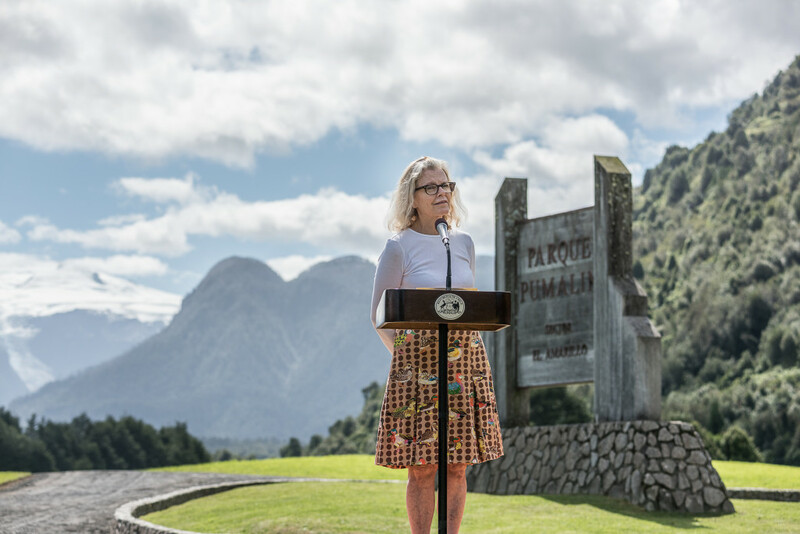 This proposal will help create the “Route of Parks,” a 17-park network spanning more than 1,500 miles from Puerto Montt to Cape Horn that Chilean citizens, nature lovers, global adventurers and tourists from around the world can enjoy. The Route will safeguard Patagonia’s wilderness and provide a boon to economic development in the South of Chile, with the potential to generate US$270 million in annual, ecotourism-related revenue and employ up to 43,000 people in the region. 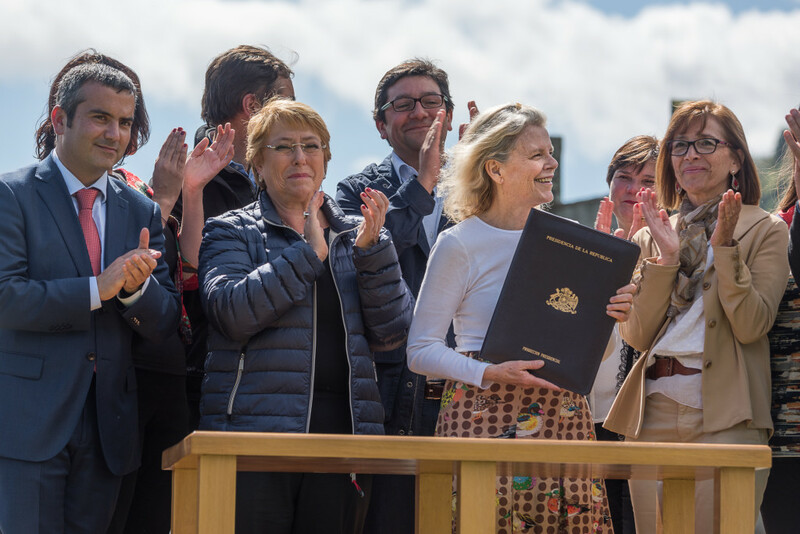 To support the government in this ambitious endeavor, Tompkins Conservation, together with key partners, is committing to creating a Chilean-based Friends of National Parks foundation for ongoing park support. Kristine and Douglas (1943–2015) Tompkins, business leaders from iconic American clothing brands including The North Face, Esprit, and Patagonia, Inc., changed the course of their lives more than 20 years ago to devote their funds, time, and passion to fight the biggest crisis in the world: biodiversity loss. After careful analysis, Kristine and Douglas concluded that creating large national parks where evolutionary processes could take their course was the most effective way to combat this loss. National parks represent the “gold standard” of biodiversity conservation, offering a unique set of ecological attributes, cultural values, ​​and economic benefits to local communities, while also guaranteeing long-term conservation. Tompkins Conservation is the leader in the Americas in what is known as “rewilding,” restoring natural ecosystems and reintroducing wildlife that has disappeared from a region because of human pressures. For live updates please visit us on Facebook, Instagram and Twitter. La agricultura afecta las tierras del planeta más que cualquier otra actividad humana. Por esta razón, estamos trabajando para desarrollar tipos de agricultura que sean más conscientes ecológicamente. Uno de los proyectos de agricultura más recientes e interesantes que estamos haciendo ahora es el campo Laguna Blanca en la Provincia Entre Ríos, Argentina. Este campo de 3.000 hectáreas, que antes había estado completamente plantado con monocultivos industriales rociados de químicos, ahora está siendo restaurado para convertirse en un campo orgánico de policultivos. Si bien antiguamente el arado mecánico para los cultivos industriales solía erosionar sus suelos, hoy en día estamos cultivando con mucho éxito una mezcla cuidadosamente balanceada y colorida de granos, verduras, nueces, frutos del bosque y hierbas. Hemos creado un video corto que muestra la increíble transformación que está sucediendo en Laguna Blanca, ¡échale un vistazo!